Use SEARCH BLOG in the top left corner to find your keyword. Here I will list some typical dishes of each area, trying to find a haiku as we go along. Travel from the North to the South of Japan, and through the seasons ! Most prefectures have antenna shops in Tokyo, where you can sample regional specialities. Check the local dishes HERE! toofu kasutera 豆腐カステラ Castella cake with tofu instead of flower. 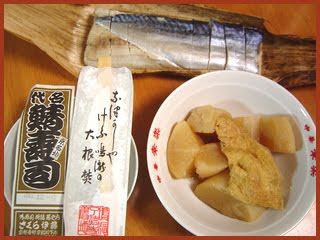 matsukawa mochi 松皮餅（まつかわもち）"mochi from pine bark"
"Hokki Ichigoni", "Hokki-shell Soup", and "Mashed Sardines"
. Tohoku after the BIG earthquake March 11, 2011　.
kikuimo, kiku-imo キクイモ　菊芋　"chrysanthemum potato"
Rokuben, Bento for a kabuki performance ろくべん, 大鹿歌舞伎 Nagano. fukuhiki senbei 福引煎餅 large threeangular senbei for setsubun, with talismans inside. you have to smash them and eat the crumbs. some are similar to TOTTORI. tai 鯛　たい sea bream is best here. Hakata no shio raamen 伯方の塩ラーメン salt ramen from Hakata, a small island famous for salt making. 地豆豆腐 "jiimamidoofu" jimame toofu, tofu from local beans, meaning peanuts. Some Japanese temples and shrines have special festivals, where food is in the center. The ones listed here are all kigo for haiku, since they are performed on special occasions during the year. A temple is a place for Buddhist worship. A shrine is a place for Shinto worship.
. Sanzenin 三千院 Sanzen-In . 5000 radishes are cooked and served in 10.000 portions for two days to the parishers to celebrate the death day of Buddha on December 8, when Shakyamuni Buddha reached the final nirvana. A bowl of soup costs 1000 Yen. 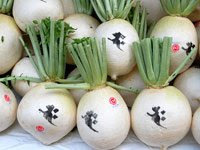 Since the Kamakura period, monks write special sanskrit letters on the radishes to ward off evil. On December 8. A ceremony "to bring winter to Kyoto". It was a very cold morning this year in Kyoto and the steam curling out of these many little bowls rising in the air could well frighten away anyone with a bad conscience. praying to Amida Buddha ! On December 9 and 10, at temple Narutaki Ryootokuji in Kyoto 京都鳴滝了徳寺. Ryotoku-Ji is situated in an area called Narutaki. Today it also has a Buddhist university. The ceremony is in memory of Saint Shinran Shonin by the Hoo On Koo 報恩講 prayer group. People line up since early morning to get a bowl of aokubi daikon soup with a bit of agetofu. If they eat it, they will not get an apoplexy or palsy.
. Saint Shinran 親鸞 . God of Cooking, Iwakamutsukari no Mikoto and Knife Rituals. mayudama 繭玉 (まゆだま) "cocoon balls"
Mitarashi dango dumplings and Shimogamo Shrine Kyoto.
. Naorai 直会 (なおらい）ritual Shinto banquets . During the autumn performance of four months every day at the Kibune Shrine, dances are performen on the request of the people. One dance is BON 盆神楽, the tray. A priest/dancer/acrobat takes two flat plates filled with rice grains of this harvest and dances around, suddenly lifting the two plates vertically in front of his face and turning so fast that not one grain of rice is spilled on the ground! Turns to the left, to the right ... many times up and down with the rice plates. Even both plates balanced in one hand, lifting it up too and spins round like crazy not to loose one grain. This dance involves daifuku mochi, rice cakes filled with sweet bean paste anko. The God of the Mountains is asked by the God of the Sea and the God of the Village (sato no kami 里の神) to share this food with all, so he breaks the bun into many small parts, gives a bite to an onlooker and smears the bean paste on his/her cheek for good luck in the coming season (fuku o tsukeru). In another dance 立神楽　not related to food, the performer climbs up a bamboo pole of 10 meters, picks up some prayer flags from there and comes down sliding on a rope, performing acrobatic tricks on the way down. a prefecture of Japan in the Chūgoku region on Honshū island. The capital is the city of Yamaguchi, in the center of the prefecture. The largest city, however, is Shimonoseki. Let us look at some food from Yamaguchi. a kind of pressured sushi with ANKO, boiled vegetables. Always prepared for festivals and celebrations. hookamuri ほうかむり "covering your cheeks with a cloth"
minced fish meat of sawara and iwashi sardines is wrapped in konbu seaweeds. Boiled in a sweet-hot soy sauce. Since the battle of Sekigahara more than 400 years ago this was prepared by the poor farmers to survive. Rice boiled with tea. Said to be good for cleaning the intestines. Bancha tea was cooked in an iron pot and then rice was cooked in the tea. Some sweet potatoes of vegetables and tofu could be added. Umeboshi as pickles. A reminder of the old Furukawa domain. Sushi with the five grains. Prepared in a specially large sushi oke with a layer of rice, a layer of other ingredients and a final layer of the five grains. Covered with a lid and a heavy stone to let it stand. Makes many portions for many people. With the bounty of the sea and the bounty of the local mountains. Also called "The Daimyo Sushi", tonosama sushi 殿様寿司. from Oshima town.山口県周防大島町. Yam 芋 was added to preserve the precious rice for a snack. Speciality of Kasado Island, where a lot of this fish is landed. Best from autumn to winter, when the fish thrive in the clean water around the island. Now they are also kept in aquariums and can be eaten all year round. kawarasoba, kawara soba 瓦そば "noodles cooked on roof tiles"
Speciality of Yamaguchi town. Noodles and meat are fried together and then sauce is added. It is now also sold as a pack to prepare at home (瓦そばセット). winter dish with a lot of radish. Can be prepared in a large pot and warmed before eating. Kurumaebi prawns from Akiho town 秋穂町 are best! They are fresh all year round. As sashimi or sushi, fried or grilled ... anything. From the town of Susa, which is playing with words on the name of the deity. Susa is near Hagi and now uses this squid to bring life back to town. They were introduced after the Meiji restauration for former samurai to plant in their estates. They could sell the fruit and earn some money like that. Some estates produce as much as two tons of these during the season.
. . . maruzuke 夏蜜柑丸漬 one whole mikan, filled with yookan jelly.
. . . aogiri 夏蜜柑菓子　あおぎり "green cut"
the green fruit is cut off the top and bottom in round slices, only a few of them from each fruit. The green outside peel of the slices are cut by hand to make them rounder. They are dried and marinated with sugar. Eaten along the coast of San-In also, in Tottori. A simple way of the local fishermen to eat their fresh catch with some local winter vegetables. from the tail of the whale, contains a lot of fat. Eaten for setsubun in February, it brings health for the rest of the year. a kind of kamaboko food, made from fresh fish paste. mountain potato (satoimo), konnyaku, carrots, goboo, lotos root and others. Chicken is boiled to give the broth its flavor. Speciality of Iwakuni. Prepared for celebrations. shirouo ryoori シロウオ料理 "small white fish dishes"
shirouo fish of the haze family. Sometimes eaten as odorigui, small fish alive in your mouth! wash down with soy sauce. or fried, boiled, with egg or tofu. shitchoru nabe しっちょる鍋 "do you know this nabe?" local dialect for shitte orimasu ka ... shitte imasu ka? With different ingredients during each season. One kind of dango is in each. This tea grows well in high altitudes and originates in Kagawa Prefecture, Takase area. Hamo is mostly fished here in Yamaguchi, in the town of Hofu 防府市. Famous from Shimonoseki. Uni Sukiyaki is also prepared. The sea urchin tastes special here because of the water quality. Best from spring to summer, when the ovaries are full. The sea urchin roe can also be fried. from Kichibe 吉部地区. They could not get any fresh fish and made sushi only with white rice, vinegar and a bit of yuzu citron juice. For decoration, leaves of green perilla shiso or sanshoo japanese pepper was used. Also called "white sushi" 白ずし shirozushi. ***** . Folk Toys from Yamaguchi . Thick, wide, fat wheat noodles eaten with kinako soy flour and sugar. The noodles resemble kishimen noodles. The dish is "chewy and delicious." This comes from using a special local flour of Oita. During the time of the Heian dynasty, a woman named "Yase" was hidden from the world, living in servitude to a young child as a nanny. 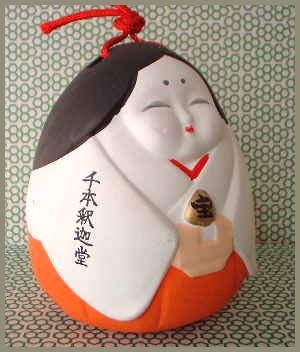 A snack she made for the child, covered in soy flour, is the origin of the Oita specialty known as "Yaseuma." This name, "yaseuma," is derived from the child's cries of "Yase, uma uma," with "Yase" being the nanny's name and "uma" a child's word for something to eat. Because this snack is based on wheat noodles, it is high in nutrition and quite tasty. These noodles are dipped in soy flour, with a bit of sugar, which gives the snack its proper sweetness. This snack is best eaten chilled in the summer. uma uma (umai umai) is the childrens version, then turned to nma nma んまんま and finally to rice, o-manma おまんま as a word for food. MA is also one of the first sounds a baby pronounces, in Italy it turned into MAMA for mother. There is even a "Yaseuma matsuri" やせうま祭り Festival in Oita. yaseuma is also called kobiri こびり and prepared as lunch when the farmers have to be out the whole day for planting rice. kobiri can now also mean onigiri. 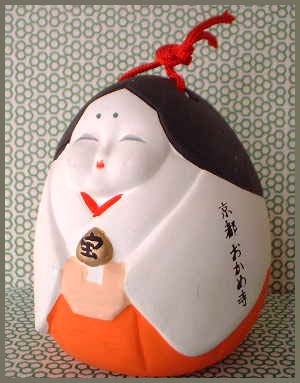 In Nagano and also Sado Island there is a kind of mochi distributed during festivals called yaseuma, or rather yashooma やしょうま. The sound of yaseuma 痩馬 (yaseta uma) can also mean "thin horse", but that is a completely differnt thing. Yamanashi Prefecture (山梨県, Yamanashi-ken) is a prefecture of Japan located in the Chūbu region of the island of Honshū. The capital is the city of Kōfu. 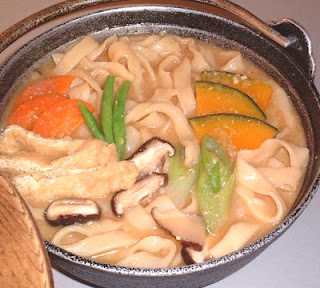 Hōtō (ほうとう, Houtou) is a popular regional dish originating from Yamanashi, Japan made by stewing flat udon noodles and vegetables in miso soup. Though hōtō is commonly recognized as a variant of udon, locals do not consider it to be an udon dish because the dough is prepared in the style of dumplings rather than noodles. Another prevalent theory suggests that hōtō was invented by local war hero Takeda Shingen. The redevelopment of industry and commerce after World War II made tourism the prefecture's most profitable enterprise, and the image of Takeda Shingen was used frequently to promote the area's regional products. Locals sought to popularize hōtō as a tourist food by advertising it as the meal consumed by Takeda Shingen and his soldiers before each battle. Modern-day tourists can enjoy hōtō in numerous local restaurants and in rather unseemly locations such as coffee shops and ice cream parlors. A more extreme branch of these advertisements claim that the descendants of the Takeda clan introduced the recipe to the Tokugawa shogunate, who then used it to develop Nagoya's miso-nikomi udon. The validity of this statement remains highly speculative. The name hōtō is commonly thought to be a euphony of hakutaku (餺飥, hakutaku); the name for udon flour after it has been kneaded and cut. The kanji "餺飥" first appeared in Nara period dictionaries, and its reading is listed in dictionaries of the cloistered rule period as hautau, showing that the pronunciation had already begun to transform into the reading hōtō. Though hōtō was introduced to Japan far earlier than udon, both names are believed to have originated from China. For instance, in modern-day Shanxi province of China, the word wonton is written with similar kanji (餛飩), and is pronounced "hōtō." It is customary for stores in Yamanashi prefecture to display Shingen Takeda’s Fuurinkazan battle flag to signify that hōtō is being served. 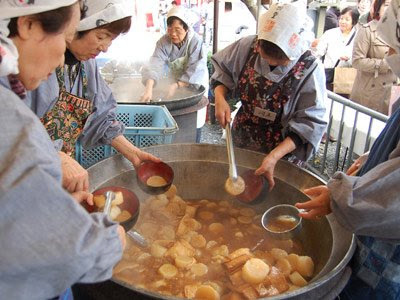 According to the people of Yamanashi, hōtō and udon are completely different and unrelated foods (similar to the way kishimen (きしめん) is regarded by the people of Nagoya). Azuki bōtō (小豆ぼうとう, azuki boutou) refers to red bean soup with hōtō noodles added instead of the traditional mochi or shiratama. Though red bean soup usually has a watery texture, azuki bhōtō consists of a thick, gluey stew, which is placed on the hōtō noodles and eaten like botamochi. A local dish from Oita prefecture called yaseuma (やせうま, yaseuma) is extremely similar to azuki bhōtō, except sweeter and considered to be more of a snack rather than a meal. In this sense, hōtō differs significantly from the modern categorization of udon. Azuki bhōtō is not common, even within Yamanashi prefecture, and is usually only found in the old Kai province region. However, some local chain restaurants list azuki bhōtō on their regular menu. The farmers of old were very poor and had little rice to eat. Breakfast is oneri, lunch is oyaki, dinner is hootoo. Oyaki are dumplings from wheat flour. The others, see below. Even the boned get soft from simmering for a long time in soy sauce and sugar. grilled around the fireplace on sticks. You bite it with the skin and all. first made in Katsunuma in 1877 by Masanari Takano and Tatsunori Tsuchiya after studying winification in France. Preserved food for the long winter time. "one persimmon a day keeps the doctor away". from 鰍沢町十谷. To thank the gods for a good harvest, all fruit and grains were placed in a winnow and shaken in front of the shrine. The winnow was an important tool for the poor farmers. 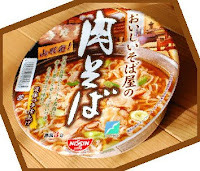 MIMI is the form of hootoo noodles from Koshu province. They are mostly eaten when still very hard, like apples. Yamanashi does not have a coast and sea fish was scarse. They used mostly dried seafood, simmered in soy sauce, prepared in Numazu, Shizuoka. On the way back on horseback along the river Fujigawa the luggage became hot from swinging back and forth and the simmering continued until they were home and just ready to taste. numaki ぬまき/ 布巻 "wrapped Mount Fuji"
Prepared at Shrine Asama at Lake Fujiko during the festival. Wakasagi fish from the lake were grilled and wrapped in rough konbu and then simmered for a long time in soysauce and mirin. Preserved well. The form looks like the great mountain of Japan, Mount Fuji. oneri おねり "honorable kneaded ones"
The poor farmers had not much rice to eat. Oneri was made from a dough of wheat, corn or buckwheat, with potatoes and pumpkin. Flavored with soy sauce. oshakakogori, o-shaka kogori おしゃかこごり "Buddha Jelly"
On april 8, the birthday of Shakyamuni Buddha, this dish is prepared from bits of grilled rice cake (arare), wheat flour and soy beans are simmered in soy sauce and the paste formed to round balls, like the head of baby Buddha. pooku, fujizakura pooku　冨士桜ポーク　pork meat from Koofu 甲府 town. Manju were made from corn, wheat, millet and other grains. Made during times of famine. Manju from wheat flour and maize corn flour. This is often served as a side dish with soba buckwheat noodles. best from Kosuge village 小菅村, proud of its clean water.
. wasabizuke わさび漬け wasabi pickles . for the gods of water at the entrance of the waterways to the paddies. Made from uruchi rice or mochigome rice with soy beans and salt. They are very thick and hard to chew and make you feel satified for a long time. 南巨摩郡増穂町 is famous for its yuzu orchards. This is a play on words with the kigo yamanashi, Siebold crabapple, and Yamanashi, the name of the prefecture. NASHI also means "not to have". "mountain nashi pear, mountain pear"
also called zumi ズミ or "mountain apple", yama ringo やまりんご. They have small fruit which resemble the normal NASHI pears, but the fruit is not eaten. inu nashi, inunashi 犬梨（いぬなし） "pear for the dogs"
shikanashi no hana 鹿梨の花（しかなしのはな）"blossom of the deer pear"
***** . Folk Toys from Yamanashi .